In step 3 we explained one way protect your files. An easier way to do it is to use the Prot-On MS Office document plugin. – You will see that a new Prot-On tab appears in the top menu. Select that tab and click on the “Protect” option. It will create a file with the same name and extension as the original but with the suffix “.proton“. This is your protected document. What else can I do with the MS Office plugin? 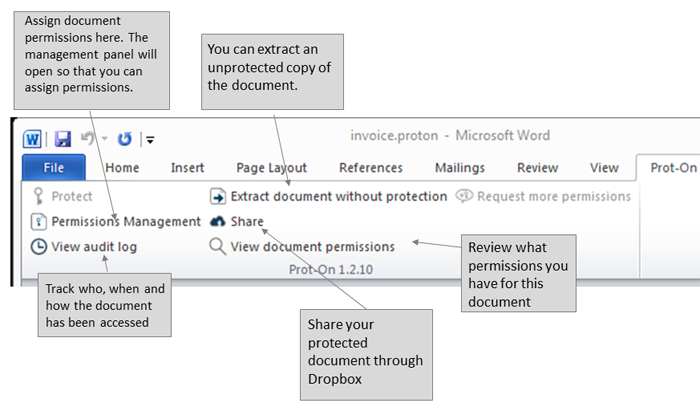 Once you have protected your Office document other Prot-On options will be activated. If you are the owner of the document, or you have permission to manage the document, you can track document activity, change document permissions, upload the protected document to Dropbox, Box…etc or extract an unprotected copy of the document. How to lock a folder (Protonized Folders)?